Eating lean or trying to get a healthy snack doesn’t have to be a challenge. 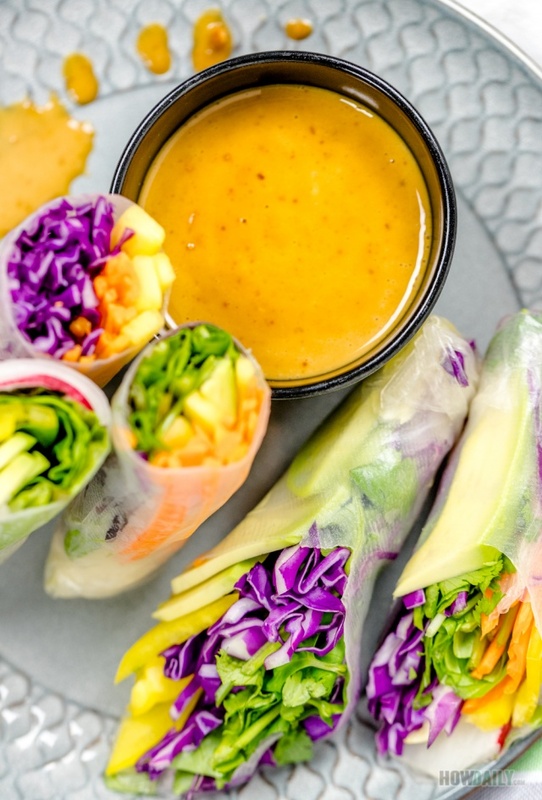 This vegan rainbow roll can be your go-to recipe in those short-times, pre- workout, quick lunch or even on-the-go snack. Best of yet, it’s so easy to fix with virtually no cooking time and fully customizable. What’s make this recipe so great is that almost all ingredients used are fresh and natural vegetables, starch-free and low carb. 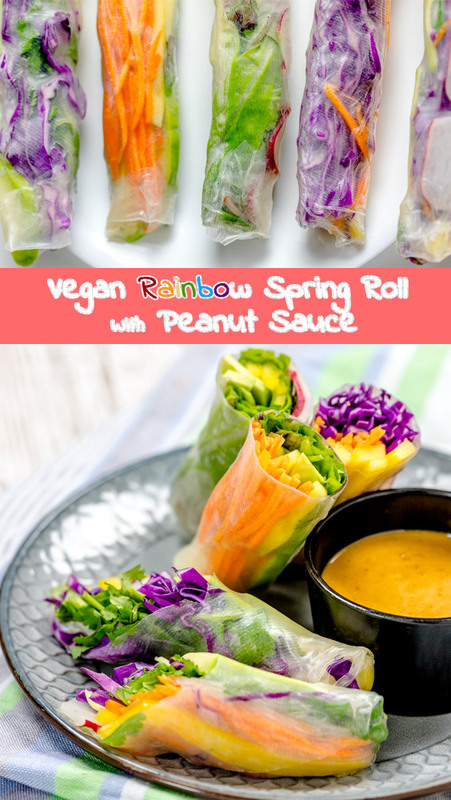 The only starchy thing in these vegan spring rolls would be the wrapper, which is rice paper; but if you’re on certain diet, feel free to replace with soy wrapping papers. Those wrappers look great too, in fact. 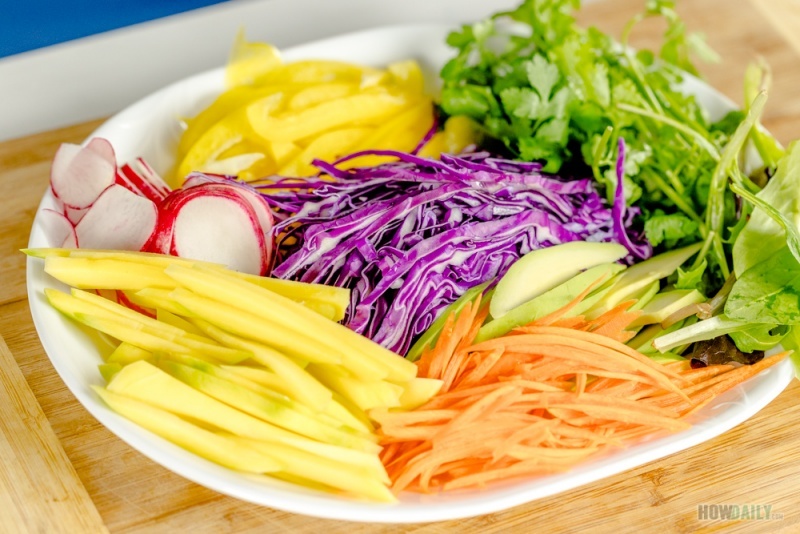 For the filling, you can go all the way veggies, fruity or mix-n-match in between. As long as they’re fresh, they’ll be good for sure. Just for variant in this recipe, I chose bell pepper, radish, lettuce carrot, etc. Anything would work, just sub your favorite in and watch as the flavor variate. Now if you are not on any diet or eating control at all and want more carb to fill that empty stomach, just add some boiled vermicelli or noodles to convert these back to its regular version. For the dipping sauce, I just go bare with peanut butter, but really any type of nut butter would do. Just adjust so that its taste a balance between sour-salty and sweetness. If you like some spice, add chili or dash of ground pepper. These, once rolled should be consumed quickly to enjoy the full freshness. Otherwise, make sure to roll and wrap each roll individually so that the moisture don’t slip out or precipitate from one to another. 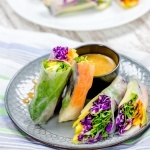 Vibrant beautiful rolls that full of natural goodness like veggies and super fruits. Dip or glaze with heart healthy nut butter dipping sauce to complete your taste-buds. Perfect lunch, snacks or work out meal. Prepare all ingredients by peeling off and cutting avocado into long thin slices. Thinly slice radishes as well as cut carrots, bell pepper into long match sticks. Make sure all ingredient is dried without dripping water. Microwave 1/2 qt water to soak the rice papers. Dip and turn to make sure rice paper are wet throughout. Arrange vegetable & fruit slices on top. Gently lift one end to fold over fillings, then roll and tuck as you go. 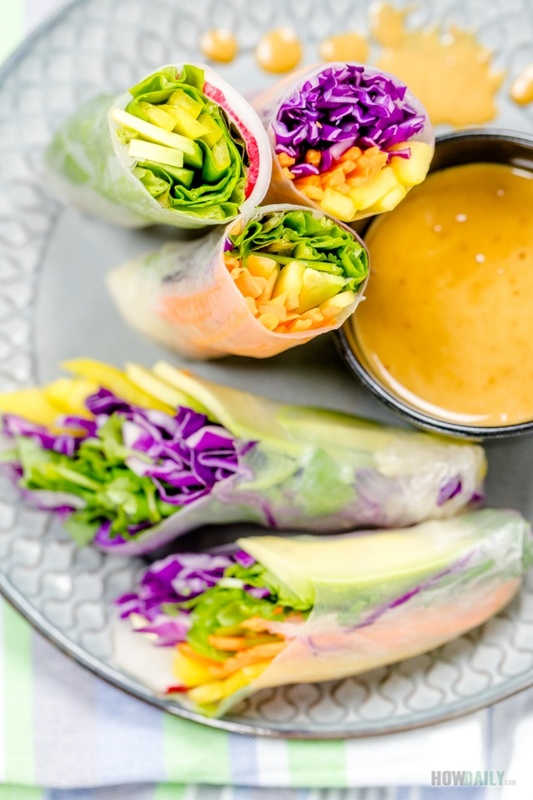 Serve with nut butter dipping sauce immediately. 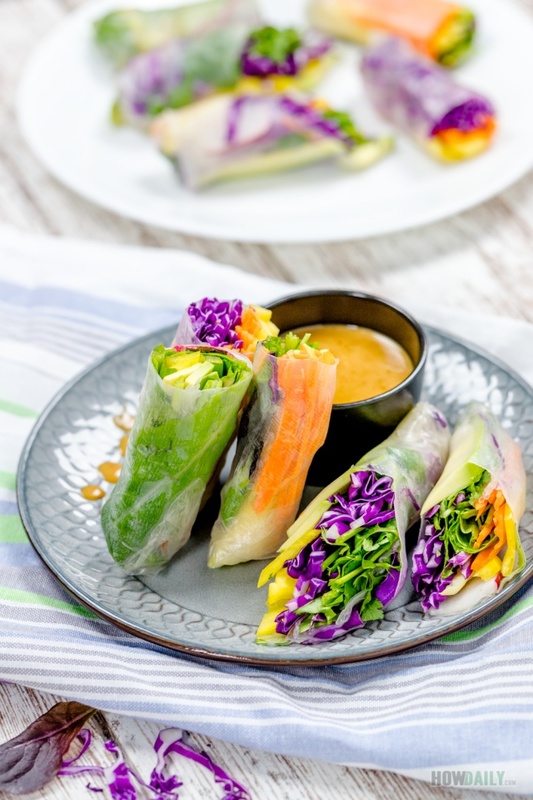 Cover rolls individually with plastic wrap to preserve freshness and avoid soggy if delay serving. Microwave or warm up 1 Tbsp of water and 2 Tbsp soy sauce. Add honey and stir till fully dissolve. Add nut butter (peanut, almond, etc.) and fork to mix them well. Finally adjust the taste with lime juice or apple cider till desire.